I don’t know how I missed this when it happened two months ago, but some genius in Croatia had the brilliant idea of setting the tooth-loosingest, elbow-to-the-faciest, beatings-will-continue-until-the-score-improvesingest sport of the modern era in its ancient habitat: the Roman amphitheater in Pula, Croatia. 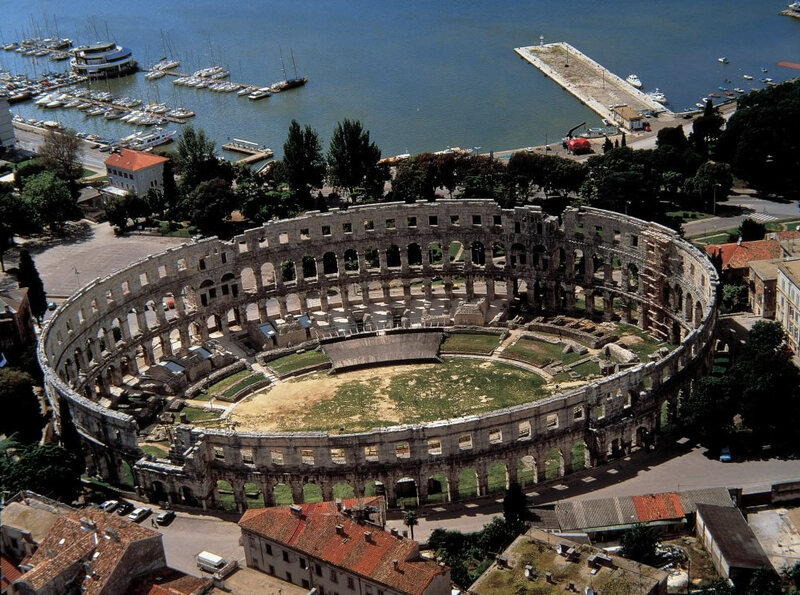 The Pula Arena is one of the best preserved Roman amphitheaters in existence, with all four of its side towers and all three levels of the classical orders still standing. With a capacity of more than 20,000 spectators, it’s one of the six largest ever built. Like the Colosseum in Rome, the Pula Arena as we know it today (there were earlier and smaller wooden and stone versions) was started by the emperor Vespasian in 79 A.D. and completed by his son Titus in 81 A.D. Also like the Colosseum, it was used as a source of construction materials after the fall of the Western Empire, but in Pula the practice was prohibited by the Patriarch of Aquileia in the 1200s which is why so much of it remains today. Italian powers from Venice in the 16th century to the Fascist national government during World War II have made attempts to dismantle the entire arena so they could rebuild it back home, but thankfully none of these plans ever came to fruition. It is felicitously located on the tip of the Istrian peninsula, overlooking the glimmering turquoise waters of the Adriatic, and today is both a tourist attraction and a 5,000-seat venue for events like movies, operas and military ceremonies. Those are fairly staid entertainments compared to the ones that took place in the first four centuries of its existence. 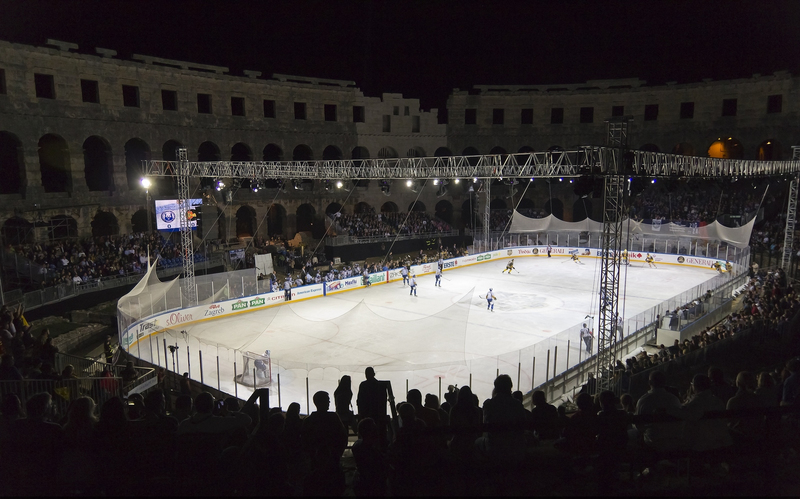 Ice hockey games, on the other hand, may at first glance seem incongruous given Pula’s mild Mediterranean climate, but thematically it’s a perfect match. Not just because of the violence either. (Are the European hockey leagues as rough as the NHL? I’m just assuming they are but I have no idea.) In their heyday, amphitheaters were the pinnacle of high-tech entertainment. They had pulley and trap door systems to raise animals and fighters from the basement, canvas roofing systems that would be unfurled by sailors to give the audience some shade, mechanisms to flood and drain the arena. Pula Arena even has water cisterns in the four towers that were used to supply fountains and spray perfumed water over the spectators. In the recreations of historical sea battles called naumachia, the arena would be flooded with a few inches of water and re-enactors would fight on ships that weren’t floating so much as mechanical props. (Full-scale naumachia using actual warships and thousands of fighters happened on lakes and in specially built basins, but there wasn’t room for them even in the Colosseum.) If they had had the technology to freeze the flooded floor, I’m sure they would have recreated Hannibal crossing the Alps. 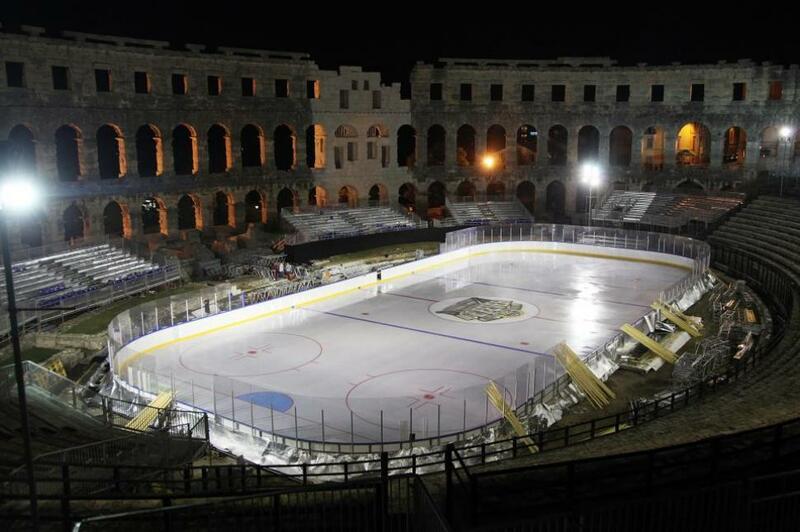 The creation of an ice hockey rink in the middle of Pula Arena was no small technological marvel even today. One hundred and fifty tons of rink- and bleacher-building material was transported from Italy to Zagreb in 22 mega-trucks and then moved to Pula in stages. Workers then built a rink on a wooden platform with a complex icing system below and bleachers to accomodate 7,000 spectators. Dimension of ice in Pula Arena will be 57 x 26 meters [187 feet x 85 feet) while the thickness will be 6 – 8 cm [2.3 inches – 3.1 inches]. Ice in Pula Arena will be placed on a specially built platform sized 1,900 square meters [20,451 square feet]; 15,000 liters [4,000 gallons] of a special liquid for freezing- glycol running in 2540m [8333 foot]-long pipes below the surface which is needed to create and maintain the ice in the open of the Pula Arena. World’s highest eco-standards are abided during the use of this machinery so after the event ends, those same 15,000 liters of glycol will be stored back in the same tanks and taken off the site with a high level of responsibility and care! 100 liters [26.4 gallons] of special paint will be used to paint the ice base layer for the purpose of stronger puck contrast on the surface and as much as 1800 square meters [19,375 square feet] of special foil will be used to protect the ice in Pula Arena from sun and high temperatures. Interesting fact is that the same type of foil is used to produce astronauts’ suits designed for astronauts to exit the spacecraft and enter the space. -12°C will be the temperature at which special machinery will maintain the ice surface in Arena; 6 foreign experts will supervise the set-up and ice maintenance helped by 70 domestic, local workers. Amazingly enough, it all worked. They managed to keep a skatable ice hockey rink going when the temperatures were in the 60s F for the three games held September 14th-16th. Austrian league teams Medvescak Zagreb and Olimpija Ljubljana went head to head on Friday (final score 2-3) and Medvescak Zagreb beat the UPC Vienna Capitals on Sunday 4-0. On Saturday a game pitted retired hockey legends from Croatia and Russia against each other. The Russian legends won 10-3. The total cost was around 500,000 Euros ($627,000), paid for by sponsors and ticket sales. This entry was posted on Thursday, November 15th, 2012 at 3:51 PM	and is filed under Ancient, Modern(ish). You can follow any responses to this entry through the RSS 2.0 feed. You can skip to the end and leave a response. Pinging is currently not allowed. What a hoot!And why not?Its there and at least they aren’t feeding the animals.Although I’m sure there is still plenty to feed the poor starving things(if they don’t mind lying,greedy,manipulative,______’s __________’s ______’s[fill in as you will]). I fear to fill all of those in! What an awesome idea. Looked like a lot of fun from all people involved. Wish I could have been there. Thanks! It does look like a great time was had by all. I can’t ice skate to save my life, but I’d be sorely tempted to go for a spin on that rink at halftime. Yessir, that is a fact. I’ve corrected it in my post. I have a question/request. I have written a little article for the PostScript newsletter of the San Diego State University Retirees’ Association that includes a description of the Pula coliseum that I visited in 1972. I have a photo, but it’s in slide form and the PostScript editor (of course!) needs an electronic version. May I use the aerial photo of the coliseum that’s the second one in your blog above? Thanks for your consideration.